After a long break from deal making, Royal Gold has inked a new one, and it has plenty of dry powder for more. Royal Gold (NASDAQ:RGLD) is one of the largest players in the gold and silver streaming and royalty space. This is a niche of the precious metals market that offers investors exposure to gold and silver, but without having to take on the risks of running a mine or the dead weight of owning physical precious metals (an ounce of gold will always be an ounce of gold; there's no growth potential). After sitting on the sidelines for a little bit, Royal Gold just announced a new streaming deal. But don't think it was idly waiting for a streaming deal to find it. Here's how Royal Gold keeps finding ways to grow, including inking new streaming agreements. Royal Gold's primary business is providing cash to miners in exchange for the right to buy gold and silver, and other metals, at reduced rates in the future. Miners use the cash for building new mines, expanding existing assets, or, sometimes, just paying down debt. It allows miners access to cash when other options, like stock and bond sales, would be prohibitively expensive alternatives. Royal Gold, meanwhile, locks in low prices for the metals it buys. This is great because it helps ensure the company has wide margins in good times and bad. In fact, the amounts paid are often set at a percentage of spot prices, so even the impact from falling precious metals prices can be blunted to some degree. Further, Royal Gold's business is somewhat countercyclical. This is because miners will likely be in the most need of cash when the industry is dealing with low commodity prices. In other words, Royal Gold often "buys low" because that's when miners come knocking. With this as a brief background, it's time to see what's been going on at Royal Gold. In late February, the company announced a $212 million streaming deal with Khoemacau Copper Mining. In exchange for the cash, Royal Gold will get 80% of the silver produced from a copper mine being built in Botswana. Copper and precious metals are often found together in nature, and it is common for a copper miner to sell off the byproduct precious metals. The deal with Royal Gold allows it to benefit from future silver production upfront so it can use the cash to fund mine development without having to wait for the production of that silver. Royal Gold will pay 20% of the spot silver price. Khoemacau Copper Mining can also sell the remaining 20% of the silver stream to Royal Gold in the future for an additional $53 million cash payment. Although not the biggest deal Royal Gold has ever done, it has the potential to increase the streamer's exposure to silver from roughly 10% of revenues to as much as 15%. And, perhaps more important, it marks a move back toward investing. The last move Royal Gold had made was to increase an existing streaming agreement in late 2016 for roughly $70 million. However, 2015 was a particularly active year for the company, with four deals totaling more than $1.4 billion. That makes sense, however, because the mining industry was in a deep downturn at the time. The mining sector has since recovered to some extent, and big deals are harder to come by. After spending so much money in a single year, though, Royal Gold's break from deal making wasn't such a bad thing. While these investments kept its production heading generally higher, they required it to take on a material amount of debt (largely on a revolving credit facility). 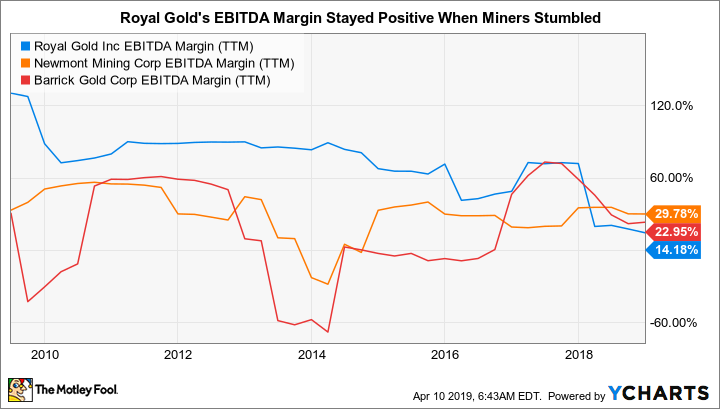 Still, the company had record gold equivalent ounce volume in fiscal 2018, as previous projects it had funded started to bear fruit. And that was its fourth consecutive record year, so its investments have clearly been working out fairly well and allowed the company continue to reward investors with regular annual dividend increases. The dividend has now been increased for 18 consecutive years, a longer streak than any of its streaming peers. That said, Royal Gold wasn't completely inactive between 2015 and 2019. It was focusing on its balance sheet. As noted, the big spend in 2015 led to a material increase in leverage as the company tapped its revolving credit facility to help fund the more than $1 billion worth of deals it had made. Since then, Royal Gold has been steadily paying that debt down. By the end of fiscal 2018, it had fully repaid its revolving credit facility. That put it in excellent position to start investing again when the time was right. Which, obviously, was with the Khoemacau copper mine in early 2019. Although the $212 million spent on Khoemacau eats up some of Royal Gold's spending capacity, its credit facility is currently $1 billion. So even if it funded the entire deal via the credit facility, it would still have roughly $800 million available for future deals. The goal, meanwhile, is to fund the Khoemacau investment out of cash flow and only tap the credit facility as needed. So there's plenty of room for Royal Gold to keep expanding its portfolio. Royal Gold can only spend on deals that are available to it, so to some extent it has to wait for the market to offer it growth opportunities. However, it has found at least one new mining project to fund. 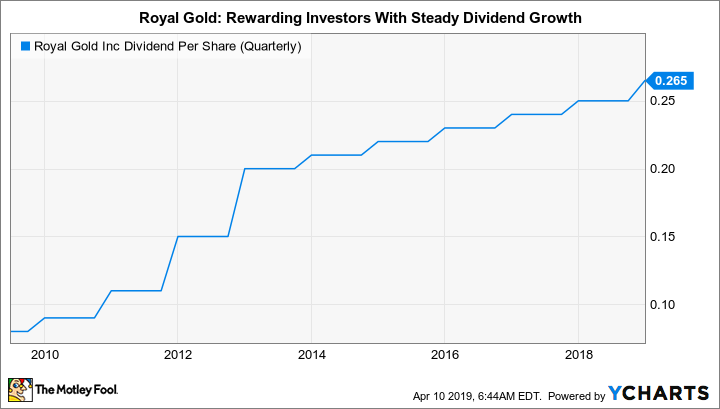 And far from sitting idle since its 2015 spending spree, Royal Gold has been paying down debt so it would be in a strong position to invest again when needed. The recent deal won't change that. With previous investments still working through the pipeline, and a new one in the works, Royal Gold is continuing to find ways to grow its business. Investors looking for precious metals exposure should take a close look at Royal Gold today, since the Botswana stream shows just how prepared it is to do some growth-oriented deals.